P.Bilaonov graduated from Ordzhonokidze Infantry Military School in 1939 and started his service as a commander of machine–gun platoon. But he felt he needed more theoretical knowledge. Therefore he decided to take an intensive course in Frunze Military Academy which was successfully completed in 1942. After that, as an anti-tank battalion stuff commander, he participated in battles for Kharkov. He was wounded there but did not abandon the battlefield. The main battle was still ahead. The Battle for Stalingrad had a decisive importance not only for the Soviet people but for the whole world. It became a start to the Nazis’ defeat as well as a beginning to establishing a new world superpower- the Soviet Union. Bilaonov’s troops liberated Granki and Illarionovsky villages and then locked up the surrounding ring over the huge German army of Field -Marshal Paulius. In that battle the regiment of Bilaonov killed about 300 German troops, destroyed 17 field guns and 60 armored vehicles, captured 1200 soldiers and officers. And this was only one of the numerous battles Bilaonov participated in. As an outstanding military commander he also participated in the greatest in history tank battle at the Kursk Arch. He also took part in liberating Ukraine. 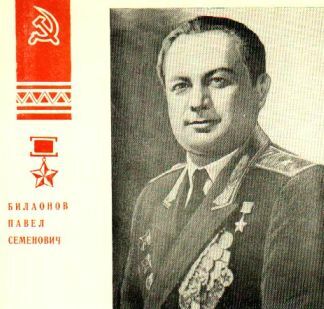 For the outstanding courage and heroism shown when forced crossing Dnestr River Pavel, Bilaonov was honored with the highest Soviet honor - Hero of the Soviet Union. He was also honored with many orders and medals. After WW2 was over Bilaonov graduated from Frunze Military Academy and later the Soviet Military Forces General Staff Academy. He made an important contribution to the Soviet defensive enhancement. *The highest Soviet honorary title established 16 April 1934 with the Gold Star medal instituted 1 August 1939, by Decree of the Presidium of the USSR Supreme Soviet. Awarded to both military and civilian personnel for personal or collective deeds of heroism rendered to the USSR or socialist society. Recipients of this award simultaneously receive the Order of Lenin, and a Diploma of the Presidium of the USSR Supreme Soviet. May be awarded more than once to an individual, in which case the recipient would receive a second awarding of the Gold Star medal, but would not receive a second Order of Lenin. In place of this second awarding of the Order of Lenin, the recipient would have a sculptural bust built in the town of their birth.